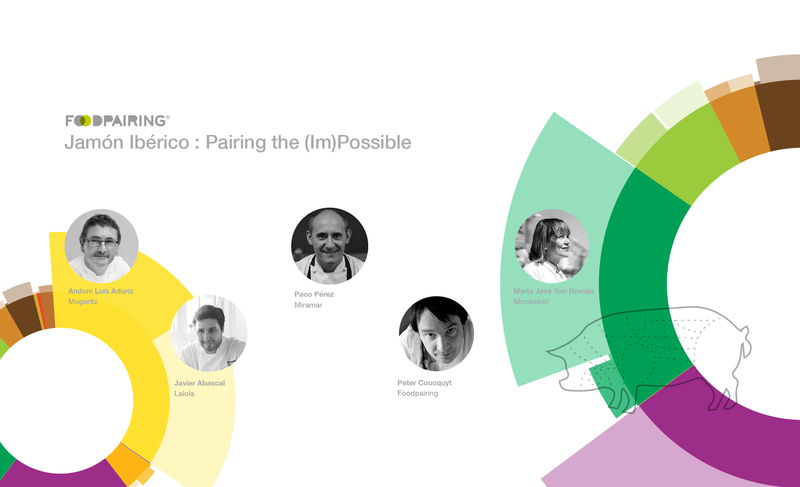 Foodpairing® will partner once again with Gin Mare for its seventh annual Mediterranean Inspirations Cocktail Competition in Ibiza, Spain. 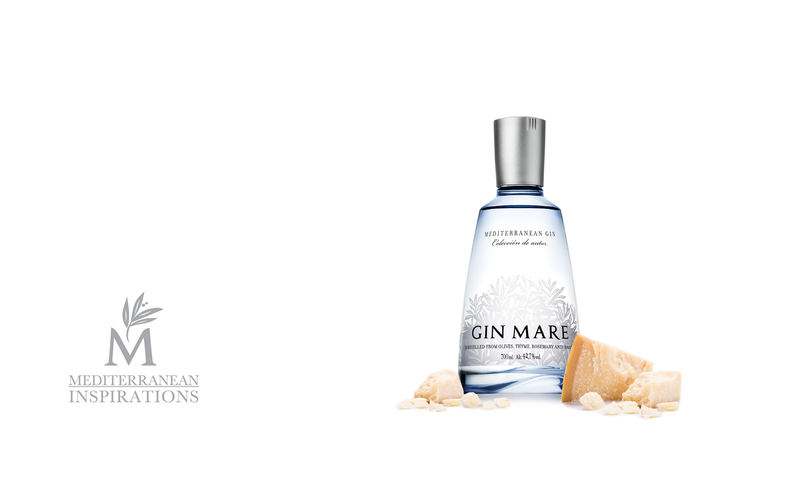 We're lending our ingredient expertise to this year's contestants by providing a complete aroma analysis of Gin Mare’s ingredient of choice: the artichoke. Find out how you can pair this beloved thistle and take your Gastrobartender Drinks to the next level! Today's artichoke traces its roots back to classical antiquity, when a wilder, more prickly variety of today's globe artichoke was first cultivated by the Greeks and Romans during the 8th century B.C. The unruly artichoke's edible heart and leaves found favor among the Arabs, who brought the 'al-karsufa' to Spain, where it was called 'alcarchofa.' From there, the artichoke's popularity spread to the rest of the Iberian peninsula and throughout Europe, eventually making its way to American shores in the 19th century. Nowadays, many cultures around the world have different uses for artichokes. Perhaps one of the best known examples is Cynar, an Italian liqueur derived from an infusion of the Cynara scolymus and other botanicals. Cynar lends a pleasant complexity when combined with other ingredients such as rye whiskey and sweet vermouth for a bitter Cin-Cyn twist on the Negroni. 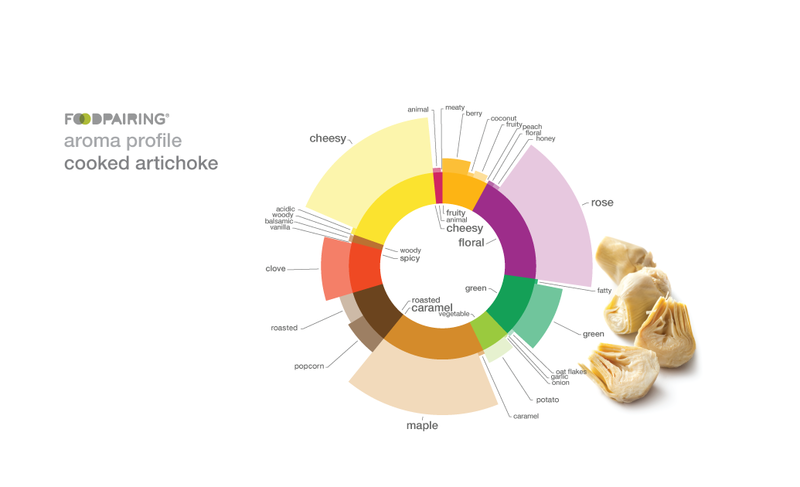 In the aroma wheel above, you'll see a visualization of the artichoke's unique aroma profile, sorted into different categories that have been labeled with more general, familiar aromatic descriptors such as fruity, spicy and green. The process of cooking artichokes results in a significant number of roasted and caramellic aroma molecules that are otherwise not present in the thistle's raw form. These new aromas make it possible for us to combine cooked artichokes with other ingredients that have also been roasted or fried, for example black tea, coffee, baguettes, ciabatta, fried bacon and even ribeye steak. The process of cooking artichokes results in a significant number of roasted and caramellic aroma molecules that are otherwise not present in the thistle's raw form. Artichokes contain a good number of rose-scented floral and honey aromas, which are often found in teas, coffees, beers and other beverages. Similar aromatic notes are also present in chocolate, as well as in certain vegetables such as tomatoes, bell peppers, eggplant and butternut squash. 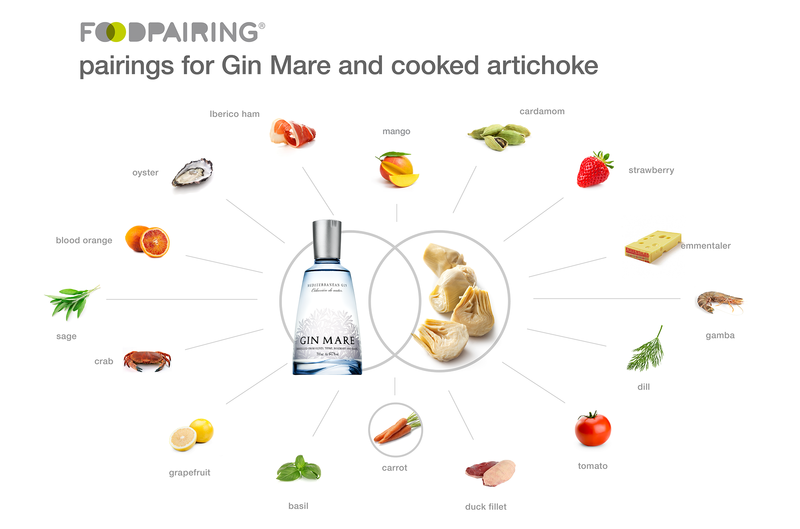 Our Foodpairing® analysis of a cooked artichoke reveals shared aromatic links to Gin Mare and 1724 Tonic that are floral, peachy and clove-scented. Let's have a look at their pairing potential! The purple flowering artichoke has a floral, citrusy aroma that pairs well with other citrus-scented ingredients such as lemons, limes, bergamots and grapefruit. Fresh herbs like basil, cilantro and even chile peppers complement the artichoke's floral notes, as do meats like duck, bacon and fried gamba (shrimp). To add an element of surprise to your cocktails, try serving your cooked artichokes with coffee or ginger beer! 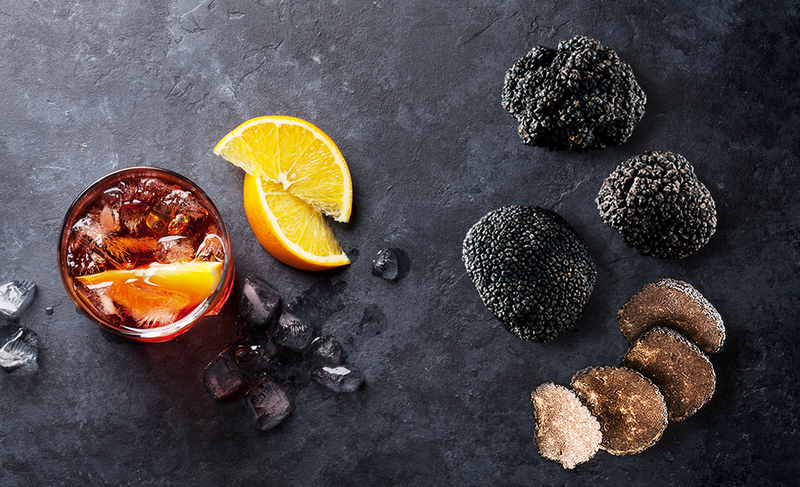 Or, if you prefer a more boozy pairing, enjoy it with 1724 Tonic water and floral or citrus-type liqueurs like Cointreau and the elderflower-flavored St-Germain. The artichoke's fruity, peachy scent is one we typically find in apricots, mangoes, passionfruit and melons that provides direct links to ginger and lemongrass. When we think about typical artichoke pairings, it should come as no surprise that it pairs equally well with savory items such as veal, veal sweetbreads and even wakame (think: umami!). On the savory end of the spectrum, artichokes also share their distinctive stone fruit aroma with Blue d’Auvergne, Camembert, Gruyère and buffalo mozzarella cheeses. To emphasize this Mediterranean thistle's spicy clove aroma, consider the different herbs and spices used in the distillation process of Gin Mare: Italian sweet basil, Greek thyme and Turkish rosemary. Other botanicals worth considering include sage, mint and nutmeg. Artichokes also contain a separate woody-balsamic, cinnamon-like aroma that we find in Campari, Conference pears, passionfruit, pineapples, raspberries, English peas and even coconut oil. It's true that the artichoke may not be the easiest ingredient to prepare, but its versatility more than makes up for the work involved. Not to mention this thorny thistle being especially high in antioxidants. As the artichoke made its way across Europe and eventually to the States, each culture learned to tame the unruly thistle, adapting it into its own cuisine. In France, the classic artichauts vinaigrette is a delicious start to any meal. One by one, the artichoke's leaves are removed and the edible portion dipped in a vinaigrette, hollandaise or aioli. The Italians often preserve their carciofi in jars of pickling juices or olive oil and serve them atop their pizzas. Alcachofas are also a common ingredient used in Spanish tortillas. And in Middle Eastern kitchens, ground lamb mixed with fragrant spices are baked into hollowed out heads of al-karsufa. 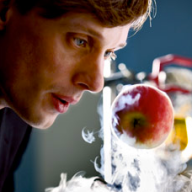 Just remember to keep on hand a bowl of water that has been slightly acidified with vinegar or lemon juice. Transfer the cut leaves and artichoke hearts to the water to prevent them from oxidizing and turning brown. 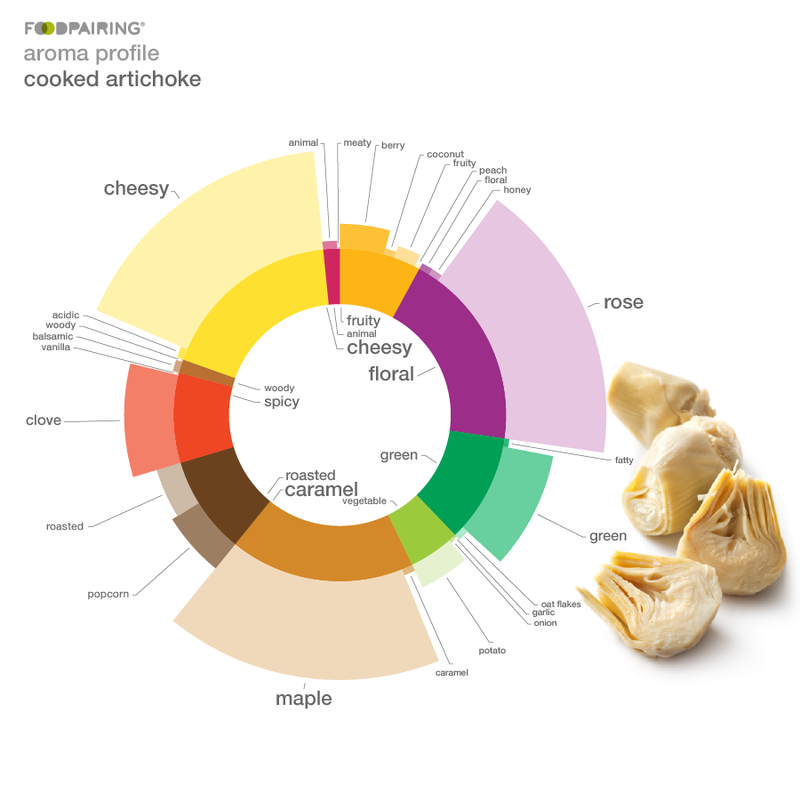 Discover your own artichoke pairings with our Foodpairing® Tool by subscribing now. Already have an account? Log in.